HINDMAN, Ky. — A short drive up a side road through dense Appalachian forest ends at a vast, flat clearing where a mountaintop used to be. The peak that stood for an eon is gone, replaced by a giant recreation area that was built after a coal company scraped away thousands of tons of earth, lowering the mountain by 200 feet. 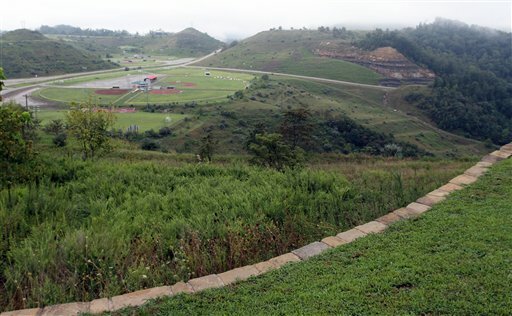 Coal industry supporters say the Knott County Sportsplex in eastern Kentucky is one of many examples of economic opportunity created by strip mining techniques that include the often-vilified method known as mountaintop removal. 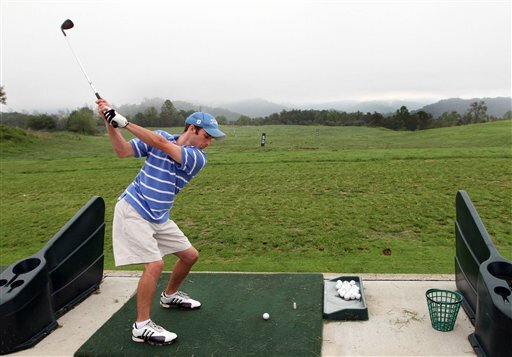 But data obtained by The Associated Press indicates that just a small percentage of the leveled Appalachian mountain landscape has been transformed into new developments such as businesses, prisons, golf courses and subdivisions. Business and political leaders in the two Appalachian states most dependent on coal have held up the developments as an economic necessity and a justification for blasting away mountaintops in the depressed region, where most well-paying jobs are connected to coal. “It really drives home the point of how much of a need there is for usable, accessible land in the mountains,” said Kentucky Speaker of the House Greg Stumbo, who built his home on a reclaimed mining site. “A lot of people through the years ask why Appalachia is so poor. One of the biggest reasons is we were land poor — we didn’t have any place to build,” the Floyd County Democrat said. The West Virginia Department of Commerce issued a press release earlier this month that said developments on former mining sites have created more than 13,000 jobs in 12 counties. Republican Sen.-elect Rand Paul has said the mining practice “enhances” the land, and West Virginia Democratic Sen.-elect Joe Manchin calls the post-mining lands a “principal tool” of redevelopment. Both men spoke of the need for flat lands in Appalachia during their U.S. Senate campaigns this year. The AP obtained post-mining land use records from Kentucky and West Virginia, the two states where Appalachian strip mining is most prevalent. In 2009, those states accounted for nearly three-quarters of the coal taken from surface mines in the 13 Appalachian states. Of the more than 345,700 acres of mining lands in eastern Kentucky that have been approved for a specific post-mining purpose, just over 6,300 acres, or about 1.8 percent, have been designated for “commercial,” ”industrial” or “residential” developments, according to data provided by the state Department of Natural Resources. The figures date back to 1999, but could include some land permitted before that time, officials said. State officials said those figures don’t include developments that can be sought by private landowners after the state ends its oversight of the mined land. Since October 2001, West Virginia has granted 218 surface mining permits, covering 84,793 acres. Of that acreage, 6,035 acres, or about 7 percent, have been designated for industrial/commercial, public service or residential development, according to data provided by the West Virginia Department of Environmental Protection’s Division of Mining Reclamation. The developed land includes an athletic complex, livestock fields and a subdivision. The West Virginia data also does not include development sought by private owners after state oversight ended. The vast majority of the post-mining land uses in both states were designated for fish and wildlife habitat, forest or pasture lands. A Washington-based environmental group found in its own study that economic developments in four Appalachian states have been sporadic on lands where mountaintop removal and other mountain strip mining occurs. The report used aerial photography and counted 500 sites in Kentucky, Tennessee, Virginia and West Virginia where a mountain peak had been reduced by at least 50 feet due to mining. Ninety sites were excluded due to active mining. The report declared that only 26 sites in the four states were host to some form of verifiable post-mining economic development. Coal industry supporters said despite the low rates, the developments that do occur are beneficial to the local economy. “Assuming (the AP’s data) is correct, then you at least have substantial development that follows these mining operations that you perhaps would not have had, had mining not have occurred,” said Chris Hamilton, senior vice president of the West Virginia Coal Association, a pro-industry group. Industry supporters also said not all former mining sites are prime for development, especially on the often remote and rural terrain of Appalachia. “The further you get away from a community or an infrastructure where you have gas and water and sewer lines, you can’t develop out in the middle of nowhere without the proper utility structure,” said Phil Osborne, Kentucky executive director of the Federation for American Coal, Energy and Security, known as FACES of Coal. Osborne said there are other economic uses for post-mining lands, such as grazing land for cattle, or ATV or other recreation trails. The Obama administration’s efforts to curb mountaintop removal mining have spurred the industry and its allies to intensify efforts to demonstrate coal’s importance to the region. FACES of Coal organized a rally in Washington in mid-September that drew hundreds of central Appalachian miners and political leaders who complained that federal government regulations are suffocating the coal industry. Osborne, a public relations executive in Lexington, said the administration’s stance has unified pro-coal efforts in several states. Osborne took an AP reporter on a tour in August of several post-mining sites that have been turned into economic developments. Stumbo’s home in Prestonsburg stands near the manicured, 18-hole Stone Crest Golf Course, also built on top of a reclaimed mine. It’s the same golf course where coal supporters posted a sign in July mocking actress Ashley Judd for her outspoken opposition to mountaintop mining. The airport’s manager, Gary Cox, said the general aviation facility that handles mostly coal industry-related private aircraft and a nearby state prison with 400 employees wouldn’t have been built if mining companies hadn’t flattened the hills. “There’s not much flat land in eastern Kentucky, and if it is, it’s usually in the flood plain,” Cox said. The airport was built at an elevation of 1,220 feet in the mid-1980s, a few years after Congress passed the Surface Mining Control and Reclamation Act of 1977. The law, aimed at striking a balance between coal production and environmental protection, sets guidelines for use on post-mining sites. It requires surface mining sites to be restored to pre-mining conditions but a provision that allows exemptions for “higher or better uses” is the one often used for such developments. Rob Perks, director of the NRDC’s advocacy campaigns, said the industry distorts the prevalence of development on post-mining sites to put a positive spin on Appalachian strip mining. “But we’re talking about over 500 mountains that have been lost” according to the NRDC study, he said. Osborne says post-mining lands have also provided places for elk herds to roam in eastern Kentucky. The animals were reintroduced in 1997 after being gone from the state for 150 years. State officials say they now number 11,000. But the mining removes most of the existing ecosystem at the site, said Doug Doerrfeld, an Elliott County resident and member of the environmental group Kentuckians for the Commonwealth. Hamilton said mining critics should consider the jobs created when mines are operating, long before the land gets developed for other uses. “The part of that whole story that doesn’t really get highlighted is that however long that mining operation existed … that company is providing gainful employment, and just creating employment opportunities for workers to provide for their families for years,” Hamilton said. If you like golf and coal, you are my friend. The land must be flat for wildlife to flourish? Funny that. It seems people associated with the coal industry, are avoiding the point here. Comparing the overall impact of mountaintop removal mining. So you people thinks it’s okay to poisoning peoples water, causing serious health implications, like cancer,kidney disease, wiping out communities, the destruction of one of the oldest forest on the planet, in order to build things such as golf courses, prisons, and small airstrips. The truth is, that over a million and a half Appalachian forest, are gone forever, and only 2% of this land has been, so called development on it. How stupid do you people think the ones living around these sites are. I know one thing for sure, we will never, ever give up, fighting this battle against mountaintop removal mining. This is a battle we will win, and I think the coal industry knows this, but is spreading lies about how good this practice is. They, (the coal industry, Raney Bostic, and especially Hamilton and Manchin), know that mountaintop removal, is on it’s way out. And when our friends at the EPA veto the Spruce 1 permit, they will know, the end is near. You cannot continue to kill folks, and communities, to maximize your profits, and that’s why mountaintop removal is done anyway, and the rest of the U.S. knows that now. The world is now watching. Given this November election results, it’s your “friends” at the EPA that will most likely be on their way out in November of 2012. Let’s just wait and see what happens to the Spruce permit, then come talk with me. Thanks for your comments … but please try to tone things down a bit and not be so antagonistic toward those you disagree with. Coal Tattoo’s comments section is a place to try to discuss things reasonably and politely and respectfully. If you want to just throw flames, find someplace else. I would appreciate seeing some statistics on the Spruce permit that include the area already destroyed on Blair Mtn. and the designated area to be destroyed. The landscape I knew as a child in Blair is foreign to me now thanks to Massey/Arch. This EPA link has more technical documents and information that might help you find what you’re looking for, http://www.epa.gov/region3/mtntop/spruce1.html … Also, this link contains the files for the Environmental Impact Statement on the Spruce Mine EIS, so it might be helpful as well, http://www.lrh.usace.army.mil/_permits/Spruce%20No%201%20Mine%20Draft%20and%20Final%20EIS/Spruce%20Mine%20No%201%20Draft%20EIS%20-%20March%202006/ .. I would like to note that the “Bob” who posted on this subject earlier this morning is not the same “Bob” who posted on a related blog entry a month or so ago. I was unable to download some of the info in the last source you mentioned. However, this does appear to be the largest MTR site in Appalachia. According to a cousin, Pond Fork and Spruce Fork are never more than seven miles apart. I suspect the coal companies want to use MTR from Spruce Fork through the Coal River Mtns. along Route 3. Pond Fork has MTR sites as does the Coal River Mtns. My ancestors settled in these areas in Logan and Boone over 200 years ago. Our heritage will be lost. I think what the “we need mountaintop removal mining because it leads to economic development” crowd needs to remember is that the line “If you build it, he will come” is from a movie, not real life. Although one of the industry people does mention, as an afterthough, that most MTR sites are in remote rural areas, they never seem to let that key fact get in the way of their economic development argument. Although, as Ken pointed out in his evaluation of the state’s rather puffball piece on the economic benefits of MTR, the few genuinely viable post-mining projects were in the northern part of WV. By and large, southern WV is being turned into a national energy sacrafice zone to no good purpose. Sure, there are some good-paying jobs there Now, but what about when the coal is gone? Tourism won’t be a viable option. Economic development can’t happen without infrastructure, which won’t happen without the population base to support it, which was driven away by the MTR in the first place. King Coal is interested in getting out as much coal as it can, as fast and as cheaply as it can – and the out-of-state corporations could care less about the mess they know they are going to leave behind. So the question, for me, becomes – when is our WV DEP going to start enforcing SMCRA and requiring real, genuine, bona fide, post-mining economic development plans for MTR permits, as the law has plainly required since it was passed? So the residents of WV won’t be left with … nothing. Again. MTR would not happen in a wealthy, powerful, and populous community because the people would not stand tolerate breathing blasting dust, dodging flyrock, or having their water contaminated. The “rural, remote” locations have people too, people whom Manchin, Rockefeller, Tomblin, etc. consider an acceptable sacrifice for coal profits. Ken, thank you for giving the opportunity to comment here. My second comment should not have been made, but when you talk about being reasonable, politely, and respectfully, I can’t help but wonder, how reasonable have the people been thought about, that have to live in a war zone everyday, and how politely have these coal companies, and the state agencies been we they wipe out communities, without even asking, or saying we’re sorry, and how can I think respectfully, after watching neighbor, after neighbor, either are forced out of their homeland, or either fall from cancer, and are no longer here. I’m sorry, but it’s hard for ones who live with this day, after day, and look at things reasonably, politely, and respectfully. Again I’m sorry, but I all I see is living in a third world country. That’s for your follow-up comment … I can certainly understand your feelings, and can see how you can find it difficult to write comments that are respectful of others. But that’s the rule on this blog. If you can’t comment politely and respectfully, then your comments will not be published. There are other forums where you and other can say whatever you want in whatever way you want. This isn’t one of them. So with much respect for your work on issues that are vitally important, and with deference to what you and so many others live with, I would again simply ask that if you’re going to comment on this blog, you try to do so in a manner that shows respect for other readers, other commentators, and anyone or anything you choose to comment about. I’ve tried — at the request of some readers and commentators — to give folks a little more leeway. I’ve found that things then quickly get out of hand. In particular, the sort of back-and-forth you had earlier with “concerned miner” can very easily escalate into name-calling and all sorts of other comments that just aren’t allowed on this blog. I appreciate your comments, and I hope you will attempt to live by Coal Tattoo’s rules when you submit comments here. Thanks Ken, I will abide by the rules of “The Coal Tattoo”. I also appreciate, and respect the great work that you do. The article by Dylan Lovan, Few mountaintop-removal sites reused, records show, that appeared in the Gazette on December 30, 2010 was encouraging. I was pleased to see so many successful projects described. Yes, we know that progress to diversify the economy in southern West Virginia has been slow. Now when I say southern West Virginia, I include the counties along Corridor G which seems to be left out when the term is used. As usual, the first hindrance described to the development of this post mined land is a lack of infrastructures. This is very true, while being employed by a land developer in Charleston I learned that you had to have roads, water, and sewer lines near the property. The state is now busy having utility lines installed, much to their credit. I hear that the authorities that over see these projects have had to relocate to larger offices. There is the problem of using more of this property to generate jobs through diversifying our economy. This has always been important, now we in the southern most part of the coal fields recognizes it is critical, because we can see the effects of reserve depletion and we hear the warnings of the deficit reduction committee. How to market these sites is pretty well defined, the question is how to pay for it. Rules similar to the Mills Act or Historical Property Contract as used in California to preserve historic property and to enhance down towns may be an example of an effective mechanism for accomplishing this. A formal agreement is executed between the taxing authority and the property owner. Over a half billion dollars of private investment in California’s historic buildings is due in a large part to this program. See http://www.ohp.parks.CA.gov. If you are thinking that I have more information about this, well yes I do. I have always been impressed with how the democrat party responds to change. The need for more jobs and part time jobs, as well as summer jobs for our young people has always been present. Now we read about increasing the retirement age. The need for a diversified economy providing a variety of jobs has never been greater than it is today and the need will increase with time. How will the party respond to the needs of the citizens? Another interesting article on the post mine land use of surface coal operations. It seems that everyone wants to jump on the bandwagon and say that nothing is being done with the reclaimed mine sites. People comment on how they are in rural areas of southern West Virginia and that they are destroying this part of the state? Has anyone slowed down and thought that even though you have an area, if approved by the DEP which does a good job in making sure you have a creditable post mine land use, that you still have the cost of installing utilities to these areas? Water, sewer, communication lines, etc.? I have posed this question time and time again; what other industry would you all bring to Southern West Virginia? Now I would like for someone to honestly give me a straight answer. Coal mining is Southern West Virginia. It is like going to the coast and telling fishermen to go else where to fish. Coal mining is West Virginia, period. Now I am not saying that I approve of destructive practices by far. Everyone I feel has to follow the law and abide by the rules of the land. I just want people to honestly think and put some serious thought into these topics and not be lead like sheep. I’ve been told on this blog before that it is not the lard fried pork chop sandwiches, non filtered Lucky’s, and the Mt. Dew in the 1 year old’s sippy cup that are causing health problems in SWV, it’s the surface water runoff from the MTM operations. At least that’s what the “peer reviewed” studies say. I mentioned in an earlier post that the first hindrance described to the development of this post mined land is a lack of infrastructures. In September it was reported that the state Water Development Authority and Infrastructure & Jobs Development Council has been authorized to spend $2 million to buy land and construct a building. I don’t often use the words proactive and government in the same sentenance but its nice when you can. When one reads about all the social problems found in the coal fields the lack of a varity of jobs is usually omitted. There is still opportunity in those hills, for those willing to adapt to todays world. The successful leader of the future will recognize this and understand that supporting coal is important, but coal reserves do not last forever and environmental regulations will not go away, so a balance must be found. I would suggest you actually read some of the health studies regarding communities near coal operations and those regarding the impacts of air pollution from coal-burning power plants … Those studies consider the impacts of many if not all of the other activities you all mention.